When I ask friends on the left to answer my two-question challenge about prosperity and the size of government, they sometimes will flip the script and demand that I answer their version of the same question. Name a jurisdiction that became rich with small government, they ask! I’ve always viewed that as a grossly ineffective debating tactic because I have so many good responses. For instance, I often point to Hong Kong and Singapore as modern-era examples of poor places that became rich places thanks to free markets and small government. But my favorite examples are from North America and Western Europe. 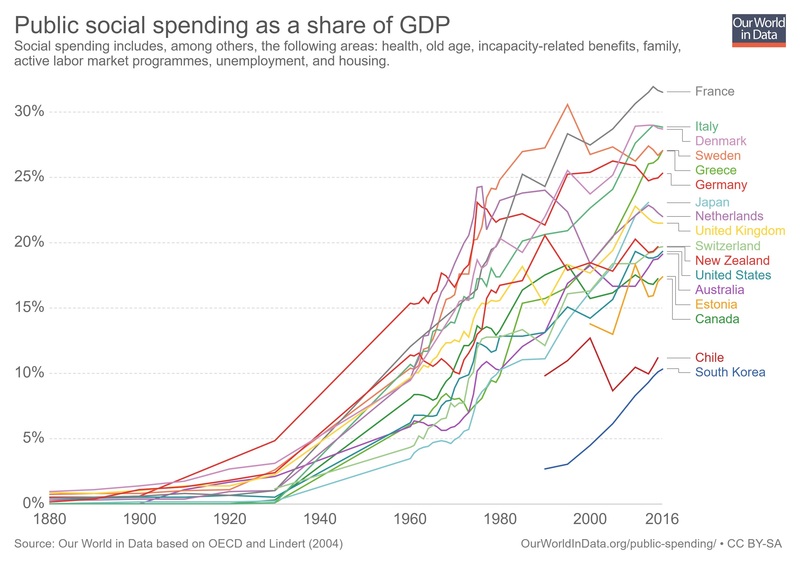 If you look at the historical data, nations in the western world evolved from agricultural poverty to middle-class prosperity in the 1800s and early 1900s when the burden of the public sector was minuscule. It’s true that all of those nations, after they became prosperous, then chose to adopt welfare states of various sizes. That was an unfortunate development (though somewhat offset by trade liberalization and other pro-market policies), but at least they got rich before making that mistake. After providing all these examples, I then tell my friends that it is their turn. Please, I ask, give me just one example of a nation that adopted big government and then became rich? I’ve never received a good answer. And this is why I’m so disappointed (but not surprised) that the Organization for Economic Cooperation and Development has a project to increase the fiscal burden in poor nations. The Paris-based OECD actually asserts that higher taxes and more spending will lead to more prosperity. I’m not joking. The OECD has a unique role to play in supporting developing countries to generate domestic revenues to finance their sustainable development. …While the ratio of tax to Gross Domestic Product (GDP) in OECD countries averaged 33% in 2008, in developing countries it was only around half this level, indicating that there was great potential yet to be exploited. …a growing focus on taxation as a development priority…as it is clearly the primary source of financing for development. …to unlock the potential of countries…the design and delivery of “modernised, progressive tax systems, improved tax policy and more efficient tax collection” were high on the list of must-dos. I’m sure that poor people in developing nations will be delighted to learn that their politicians are conspiring with the OECD to “exploit” them with “progressive” and “efficient” tax regimes. But the section on how taxes supposedly are good for growth is downright unbelievable. Taxation enables governments to invest in development, relieve poverty and deliver public services to underpin long-term growth. Strong tax systems not only raise crucial revenues: they also promote inclusiveness… Above and beyond the direct benefits to developing countries themselves, international co-operation in the area of taxation is essential in today’s globalised world. …Such actions can realise the potential of taxation to help drive development on a global scale. You won’t be surprised to learn that the OECD does not provide any empirical evidence to back up this rhetoric. The bureaucrats don’t even provide a single anecdote or example. Nothing. Zilch. Nada. Instead, we’re supposed to believe that there’s a mysterious alchemy that somehow leads transforms higher taxes and bigger government into greater prosperity. By the way, the OECD isn’t the only international bureaucracy pushing this message. I had the surreal experience of being a credentialed observer at a United Nations conference where seemingly every other participant was on the other side. And the International Monetary Fund is also guilty of this peculiar form of economic malpractice. This video from the Center for Freedom and Prosperity examines whether big government is the right way to boost prosperity in poor nations. P.S. I don’t know whether to characterize this as irony or hypocrisy, but OECD bureaucrats don’t pay tax on their lavish remuneration. Perhaps this explains why they are so oblivious to the real-world consequences of higher tax burdens. P.P.S. I feel sorry for the professional economists at the OECD, who often produce very good studies. It must be embarrassing for them when the political appointees push bad policies. P.P.P.S. Needless to say, I’m not happy that American taxpayers are financing the OECD’s statist agenda. I see how to do it from here, would like to share from email version sent out to me…. How can I share your posts on social media? Please provide links to do that… thanks!